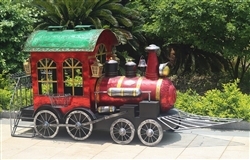 Medium Christmas Train is made of iron and aluminum. Welcome in Christmas with this beautiful Train. It is painted with electrostatic paint and won't chip or peel. You will use this Train for many years to come. The dimensions are: 83" L X 40" W X 45" T. This Train is too small for children to board it. The Train is more of a Christmas Prop. The customer assembles it with tools provided in the carton. Call for availability and shipping rates.